This 3 legged Feng Shui money toad is said to bring monetary gain, wealth and good health. This mythical Frog is also said to protect against misfortunes, drive away evil and also protect wealth. The legendary three legged money frog also known as the three legged toad or Chan Chu in Chinese is probably the most auspicious symbol used in Feng Shui. This symbol is linked to the moon and thus the principle of Yin. This 3 legged money toad is said to bring monetary gain, wealth and good health. 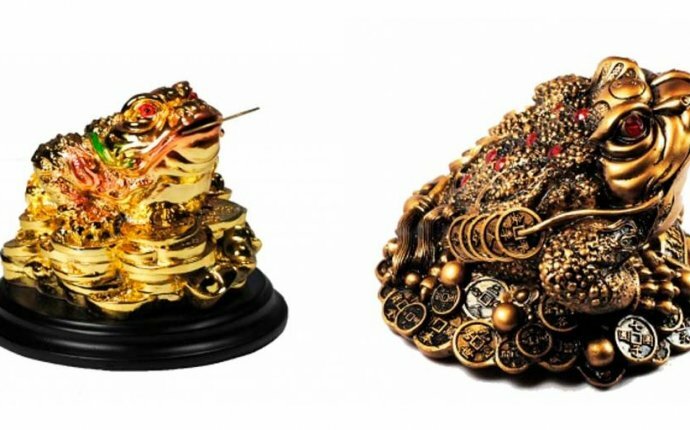 This mythical Money Frog is one of the Chinese holy creatures that also protects against misfortunes, drive away evil and also protect wealth. This frog is often portrayed sitting on a bed of treasure made up of gold ingots, coins and jewels and bearing a coin in its mouth. The back of the Money Frog often shows 7 diamond dots depicting the Ursa Major Stars on which the Chinese Astrology is based.This is an ideal symbol to be kept in homes, restaurants, offices and places of business to enhance money luck. Where to keep the Feng Shui Money Frog? When placed at home this Three Legged Money Feng Shui Frog Symbol can be kept in a corner of the room where the gathering point of chi is strong or in one of the corners inside the house near the front of the main door facing inwards signifying cash flow inwards. 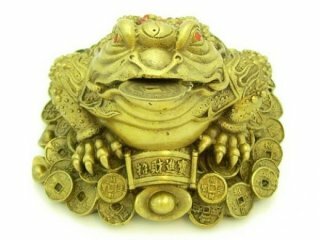 The Money frog is placed in wealth activates what is traditionally believed to be the Wealth Luck of the household. This symbol can also be kept near cash registers and receptions at the place of Business. It should never be placed inside the bedroom, bathroom or kitchen. Also do not place him facing the main door which is symbolic of money leaving home. Although there is no limit to how many toads can be kept it is advisable to keep a maximum of 9 toads or multiples of nine. This 3 legged Feng Shui money toad apart from being a lucky charm has a decorative value and also is a good gift article.